A good pronounciation is extremely important when it comes to learning Cantonese. Many Cantonese words do not just sound very similar, the concept of "tones" also allows one word as it is known from English to have several meanings. Learning those tones properly is therefore not just important so people will understand what you say but mistakes in the beginning are also very hard to erase at a later stage of learning, so putting some extra effort into this in the beginning will definitely pay off. This graphic shows 6 of the 9 tones. Tone 1 is a high flat one, tone 3 and 6 are also flat but at middle- and low range respectively. 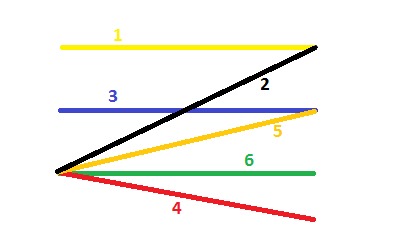 2 and 5 are rising tones, whereby 2 is rising right up to the top and 5 is just rising to mid-range. 4 is the only tone going down. As can be seen, those tones exist mainly as flat tones with high-, middle- and low-range. There are loads of syllables like aa or faat, the Pronounciation Tool covers all syllables. This will be very helpful in the beginning. The already mentioned Jyutping is the romanization of Cantonese characters and helps a lot when learning how to pronounce certain characters. And because it is so important, the next section covers everything needed to be known about that subject. Finally, beginners with no experience at all are strongly encouraged to either find Cantonese speaking friends or take classes. As mentioned above, mistakes made in the early stage of learning Cantonese, especially concerning pronounciation, are very hard to erase later on, so make sure somebody checks your pronounciation and gives you feedback on how to improve - 1 or 2 hours a month 1 on 1 are often enough, just learning it yourself is possible of course but very difficult. Furthermore have a look at the Pronounciation Tool, that might help a lot especially in the beginning.